I’m getting an error on the demo and not seeing what I’m doing wrong. I’ve attached the screen shots of the issues. Any help would be great. I just now was able to log in successfully using the credentials shown in the upper part of the screen shot. The screenshot shows two Log in windows. In the second, the Server field is empty. Given the position of the error window, it looks like the failure is coming from that second instance. Make sure all 5 fields are set before clicking the Login button. Hi! 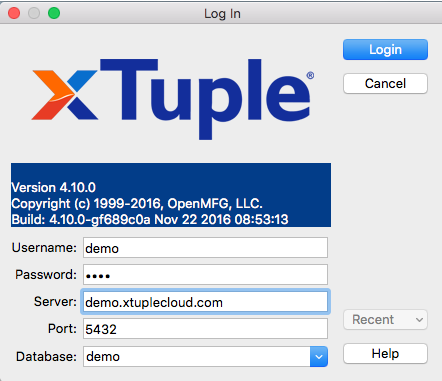 I just registered for xTuple Free Demo recently. Database: demo, which I keyed in as instructed. 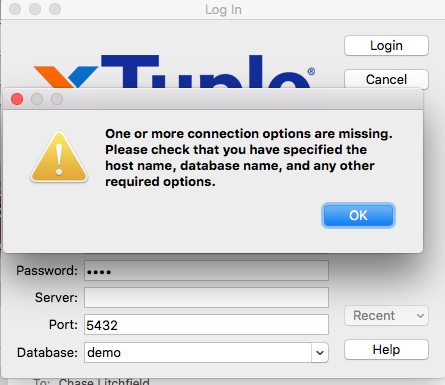 I keep getting an error " could not translate host name "demo.xtuplecloud.com" to address. Unknown server error QPSQL: Unable to connect. I have searched the User Forum, I can't find similar issue. The demo is working fine, and all the information shown is correct. Perhaps a DNS or firewall issue on your network? Make sure that your network administrator has not blocked port 5432. Hi Ned. Thanks for responding. I will test on a different network and come back to you tomorrow.